My opinions on value investing. The idea is to create a value discussion on stocks and concepts. You might find this blog leaning a bit towards Dalal Street but the concepts should travel well across global markets. Please note that I may or may not have a position in these stocks. Please use these opinions after through independent research and at your own risk. Bionics - Robo advisors that have a human component to them. I have been told that some large banks have robo advisory services with a human element. A few startups are present in this space as well. Self selected basket - Several websites provide this service the most famous of which is Scripbox. ETF recommenders - There are few in the works in the ETF space - but the lack of depth in the ETF markets makes it difficult for the advisor as yet. I am fairly sure this space will do extremely well in the future. Quantitative - Wixifi is the only advisor I am aware of in this category. I believe there are others developing this technology. Unfortunately Quantitative algorithms are still mostly available to only to large investors like FIIs, HNI, family offices and DIIs. Wixifi is my attempt in trying to democratize the technology and bring it to anyone who wants to use it. Simulated Back-tested performance: You can see the results of the various risk levels against other asset classes (FDs, Gold, Real Estate and NIFTY) before you invest. You can even see the simulated portfolios at any time slice in history. In addition the impact of capital gains, entry loads and exit loads has been taken into account on the simulated portfolio but not the other asset classes. The results are fairly interesting and I would love to hear your feedback on them. Single click to invest across several funds: You can check the trades before clicking buy. In India, by law discretionary management requires a special license and a minimum investment so you have click each time you buy. This is a very good thing because I have found that several people find the thought of discretionary management very discomforting. Automated Rebalancing: This feature lets Rebalance you entire portfolio in 3 clicks. Now several people ask me why wouldn't someone just go to Wixifi and buy the funds we are recommending today. The biggest reason is that Rebalancing without the Wixifi system is a pain - which is all automated by the platform. It figures out the target portfolio, capital gains tax, exit loads and then makes it super simple for you to just execute in 3 clicks. Safe and Secure: The investment is done through MF Utilities India Private Limited which is a joint venture of 25 of the most respected AMCs in India. Moreover your money is directly transferred to the Mutual funds by their payment gateway (BillDesk). So I urge you to find some quantitative investing avenues and test out the Simulation and investment platform at Wixifi. Total Market Cap to GDP: Does the 1x hold for India too? Total market cap to GDP at the end of April 2015 stood at around 84%. Still below the buffet statement of 1 times total market cap to GDP. At the end of Feb 2015 it went up to 89%. The question I am trying answer is whether the 1 times total market cap to GDP holds true in the case of India. The private to public paid up capital ratio is 36:64. This very surprising to me because I thought the majority would not be listed in India. Also paid up capital does not include retained earnings and this factor could very well be off the mark but its a start. 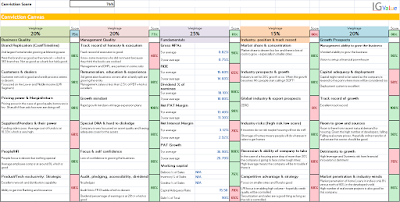 My notes on DHFL - Dewan Housing Finance Limited from Feb-Mar-Apr 2014. The company continues to have some good shareholders like Rakesh Jhunjhunwala and the government of singapore. The LTV is falling and the NPAs are up a bit but not very much. The company still claims they have excess provisioning. I wonder why Mr. Market has been reducing his bid on the stock all the way from 552 to 431. 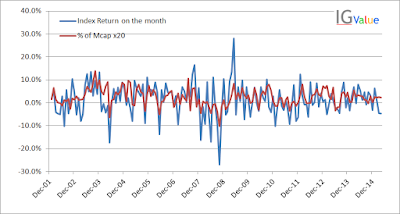 Do FII flows drive market returns? FII flows are the drivers of the Indian market as we have learnt in the institutional derby article. Just to refresh the numbers, total institutional flows are about 80% of the market volume. Of this 3/4ths is FII flows. This made me wonder how well the index return and the FII flows would be correlated with each other. Thus about 60% of the market volume is being controlled by foreign institutional investors. From January 2002 net FII flows into the country have been 122 Bil USD - Which is over 5% of the current GDP! 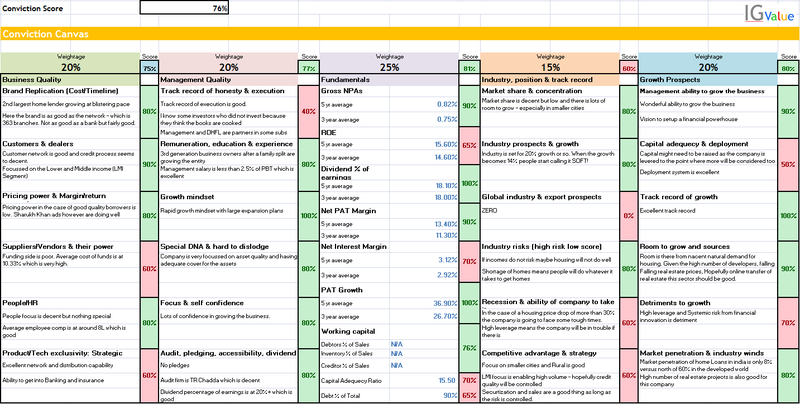 Cloning the Dolly Khanna portfolio blindly: 40%+ in fy2014 with 14% Index outperformance! Past performance is no guarantee of future returns - please read individual scheme related documents carefully before investing. © Ishaan Gupta, 2014. Contents may not be reproduced without permission. Simple theme. Powered by Blogger.